Pros: Clearly, the ease-of-use and seamless integration between our CRM and their service. And quite literally the cost versus the benefit is clear, worthwhile, and actually beneficial. Cons: That I didn't find them sooner. :-) But With maybe a tiny tweaks here and there, the overall output is rather consistently good. Overall: When I think about leaving review, it has more significant now that I'm at a business owner my reviews are getting an off a lot of traction, so much so that hey Review can seem to say 1000 words more than a photo ever could. With any service based business, gathering reviews is paramount. NiceJob has fit that need for us and have become an essential aspect of our business growth and development. Pros: *Integrates seamlessly with our scheduling system - HouseCall Pro. Cons: The only con, is it doesn't integrate with Yelp for our customers to leave a review, but that is simply because Yelp has a strict policy. Overall: The executive has helped us build our website, he knows what he's doing, super knowledgeable, professional, kind, and FAST! If there's a question you have or something you'd like to change on your website - they make it happen quick! We're used to waiting days - weeks for website changes to happen. OVERALL AMAZING STAFF AND INCREDIBLE SERVICE. 5 STARS ALL THE WAY! THANK YOU ALL FOR YOUR HELP. Pros: The software guides our clients thorough what some feel is the arduous task of leaving a positive review. It helps remind them if they wanted to leave a review and then shows then the review sites that they already use. Cons: Someones the AI doesn't detect that a review had been left by a particular client and it continues to nudge them, much to their annoyance. These are few and far between, though. Overall: It has changed our SEM, SEO and reputation for the better. We're getting client and prospect engagement on social media through the automated posts and regularly get compliments on our high level of communication. Pros: It's easy to use and integrates with my CRM (Jobber). Once the job is closed, the review invite gets sent out up to 4 times. Cons: Sometimes if the customer doesn't use their real name the system has no way to know that the customer I sent the invite to actually already left a review so they keep getting email until the end of the campaign. Overall: Awesome. It's so much easier to close jobs when your reputation is glowing online. When we have 161 google reviews or more than 50 Facebook reviews and our competition (whom we still love) only has a handful, it makes the decision pretty easy for the customer. Pros: I love the ease of use of the software. It's extremely simple to use and after they help you set it up it does everything for you. Incredible. Overall: I researched many automated review generators and nice job were the only ones not extremely pushy to get me to buy it. The gentleman was extremely friendly. After my research nice job seemed the most reasonable. The service is amazing I ask my customers for reviews every stop but lack the convenience of having it in front of you so I believe they don't for that reason. Nice job puts it right in front of them with a text, super easy. I love it I recommend it to any friend so have who own their own companies because it has been so great for us. Reviews make business or break business these days and if you have a 5 star business it's crucial to have an easy way for your customers to let everyone k ow that you are in fact a 5 star business. Thanks for the great feedback, we really appreciate that you took the time to write this. Amazing customer service is so important to us, so hearing experiences like yours means a lot. Pros: I haven't worked with a better software company, they say will they will do them over deliver. Pros: I can not begin to say enough about this company! Fabulous customer service and the value of this product is amazing! The time saved in the review process alone more than pays for the product! Cons: There is nothing that I dislike about this product! Overall: Our most expensive cost is time and NiceJob solves this 100%! Pros: We use Nice Job for the reviews and they designed our website. They do everything that they claim to: send out review requests to our customers, post them on social media, the website looks great and is easy to make changes to. Cons: Nothing, everything has been top notch. Overall: We have seen a 59% increase in the number of positive reviews since signing up with Nice Job. Our website was outdated and they made us a website that looks great and is easy for our customers to navigate. If I ever need to make any changes to the website, I email Chloe and I get a response almost immediately that the changes have been made. I've never worked with a company that is as competent as Nice Job.Thank you for all that you do. Pros: Amazing review management software. Easy to use, very customizable, their convert website product brings results. Cons: Their Zapier integrations can have faults. Great SEO and company display! Pros: Display and easy to add new projects. We are getting great SEO and ranking is great. Cons: Accessing videos and uploading could be better. Overall: We have used Hatch for the last few years to show off our cleaning company to potential customers. We have had nothing but success in attracting a steady flow of new business. Also sharing our latest projects on social media is easy with Hatchs features. We really do feel we are getting full value for our investment with Hatch. Thanks Shawn! Great feedback, and we'll work on making the videos and uploading easier...love to get your next review up to all 5 stars! Pros: Ease of use, price, and RESULTS! Nicejob delivers the results they promise. Cons: Nothing really. It has helped our online reputation tremendously. Overall: We met company representative the ICE Expo and signed up for the free trial of NiceJob. We gained so many new reviews from the trial that it was a no brainer for us to continue using the software. Love hearing about those results Jeremiah! That makes our day, and keep up the great customer service, your reviews are awesome! Pros: This is by far the best money I spend each month. I went from 2 google reviews that I had to beg for to 50 in about 6 weeks. As a result my SEO has naturally ranked much higher and my phone rings nonstop all day. Plus my customers trust us before they even call us because all of the reviews have been so positive. Cons: My only complaint is that they do not make it easy to call them. You have to communicate with them through a web portal. That can be annoying. Overall: Great to work with. Thanks for the great review Colby! Going from 2 to 50 in 6 weeks is pretty awesome, well done! Improving our phone support response times is something we're working on as well, we're implementing a cloud call center to help us handle that better. We're looking forward to getting you from 50 to 500 now! Probably one of the easiest programs I've set up for business and that actually works. Pros: The fact that this actually works and works well is huge. With so many tech companies out there, it's hard to choose. With NiceJob I've received about 10 reviews within a few days! This was only during the free trial. The paid version integrates with my dispatch software and will automatically work once jobs are complete! Saves time and makes money all at the same time! Excellent ROI! Thanks for the great review Doug! Love hearing feedback from our customers, and if you love how effective NIceJob is now, wait till you see what we have coming! Pros: NiceJob is synced with my CRM and makes asking for reviews a breeze! Being able to access everything via iPhone app is a plus as well. Cons: This is only the second day using NiceJob. I did set up a test on myself and noticed the message that was text to my phone did not highlight my google link for easy 1 touch redirect to leave a review. I feel like this needs to be addressed to make it simple for my customers to leave a review. Thanks Phillip, thanks for the great review and excited to be working with you! We've also reached out to you via our support channel to get details on the Google experience you mentioned. NiceJob automatically detects if your customer is logged into Google, and if they are directs them straight there, essentially a 0 touch redirect! Pros: NiceJob has made the process of acquiring reviews a breeze. We perform the same high quality work as always but now our customer's have an easy portal to tell the world! Cons: I haven't found any flaws in the system. It just works and well. Overall: Reviews are better than paid advertising and we have spent years slowly acquiring a stellar 5 Star reputation. Even the most spectacular results and promises from our most enthusiastic cheerleaders, do not always guarantee the follow through to an actual review. NiceJob makes this process painless and quick, resulting in a year's worth of reviews in less than a month! Thanks Wayne! We love to hear that it's been that easy, thats our goal, to make this whole process as easy as possible, while getting you a ton of reviews! Cons: We are not getting as many reviews as we would have liked. Overall: Pretty good for the money. Thanks for taking the time to review NiceJob! We'd love to help you get more reviews, reach out to our customer success team via the in app chat bubble or our 1800 line and we'll make sure you're getting the most out of NiceJob! Comments: My old website cost nearly $ and then a monthly fee to have SEO and it did not look as good as my NiceJob site and barely produced any inbound customer requests. 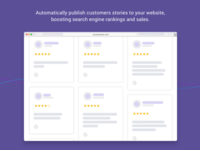 I've had the NiceJob marketing platform for about 2 years now and from day one it blew the doors off my old site as far as customer leads, it looks 10 times more professional and it also makes staying on top of social media almost effortless. To say that I am Super Impressed would be an understatement. I highly recommend the NiceJob marketing platform. Thanks Arie for the awesome review! Love hearing feedback like that, and can't wait to keep working with you to grow your company even more! Great experience! Great work! Great customer service! Pros: Blown away by the website that was created for me. Looked into these guys years back when we first started and didn't pull the trigger because of the price and just did my own work on an alternative site builder... THAT WAS NOT SMART!!! I'm certain I lost WAY MORE in missed business than the LOW monthly cost. Guess you live and learn. They were super quick and responsive with building the site and in answering any questions that I had. Thinking about the move...STOP RIGHT NOW and JUST DO IT! Cons: UX could be improved to decrease hunting for what I need. Could use some more videos to explain the software, but I may have just missed those. We received more Google reviews in 7 days than we've received in the last three years. Pros: Easy to setup and to use. The "Collect Leads" and "Trust Badge" widgets displays and work well with our current website. It's nice to show reviews collected from Google and other sources on our website. Cons: We are new to NiceJob and because of this we haven't come across a true con for us. We do wish the stories widget was more customizable, right now the stories show as one big "page" that users can scroll through. It would be nice to have a rotating widget with a fixed size which may help for mobile pages. Thanks Marvin! Great feedback, and the team is working on a really cool type of rotating review widget I think your going to love! Pros: The ease of use, it does everything automatically. Cons: That we didn't do it sooner! We have had great success using this product. Thanks for the great NiceJob review! 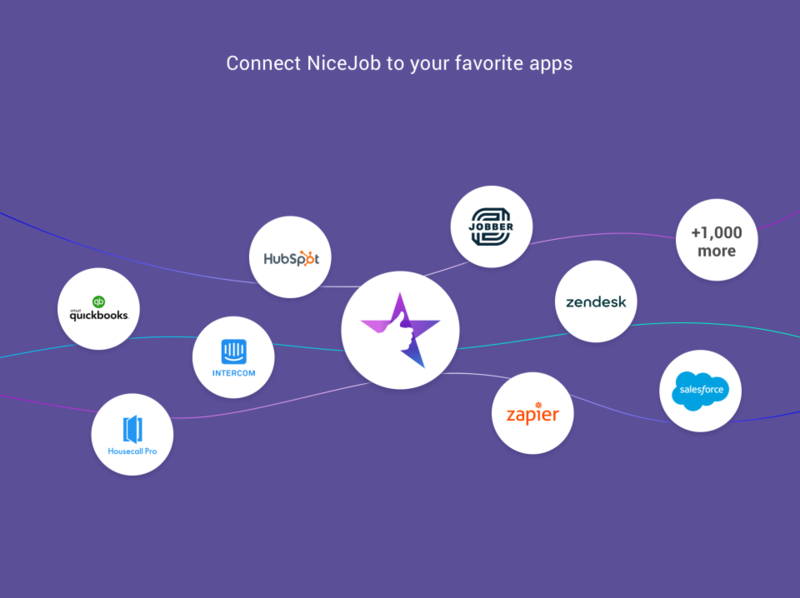 Love hearing how NiceJob is helping companies get more reviews, and we've got some huge new features in store for you soon! Pros: Automated and so easy to use for my employees which makes my job better. I want my employees to use it more often. Thanks John! Love working with you! Pros: How easy it is to use. The results are of the charts with the convert website and the ability of nicejob to get reviews. I am a marketing director for a tree care company, & I used NiceJob to outsource our website build. Pros: Excellent response time and service level by the NiceJob team. Tremendous value for the cost, and ROI is easy to prove. Quality of final product, and ease of functionality/use. Cons: Honestly, I have been working with them for over a month, and I have nothing negative to report. I initially contacted BirdEye for help with review generation on behalf of the owners of the tree service that I work for. I received a response a month later, and never even got pricing. That was far different than my experience with the NiceJob team. Overall: User friendly review management process, well built website, complete outsource solution. A website that pays for itself! Pros: Ease of use, simple to fetch customer reviews, integrates well with online tools, outstanding customer support and service. Overall: Representatives and the rest of the Hatch crew are amazing. They made the transition from our old site as smooth as possible. It's so simple to add photos to the site that will instantly get shared to your social networking site. Getting reviews from customers can be a hassle, but with the Nice Work feature it's now easy. I directed someone in a hurry for a bid to our site the first day it launched. Within minutes I was notified via text from Hatch that same person received a quote, and booked an appointment. My only regret was not converting sooner! Pros: It's worked. We've gotten 10% reviews since we started and I backlogged the previous 90 days. We've even booked a couple of jobs in response to a review email. Cons: I wish we could add a specific picture to the auto request. I know we can individually, but not on the auto. Overall: It's a great way to auto ask for reviews. The personal email has even gotten other type responses because the client thinks I've sent it out. I think it's a great systematic way to grow your reviews. I like how it shares it on fb too. Thanks for sharing those great results Benjamin! We're looking forward to helping you keep growing your company! These folks have their game together! Pros: We shopped around to find the most effective and cost-efficient program out there. We quickly learned the fine folks at NiceJob have their game together. We did our research and asked current customers. They praised NiceJob for helping grow their business. An integration with HouseCall Pro is a huge plus. Cons: It's not free! Just kidding, it works well. Overall: Integration with Housecall was a plus. Smooth and seamless signup. Thanks Patrick! Really appreciate you taking the time to review us, and were super excited to help you grow your business! Pros: Best customer service and my website ranks #1 in the window cleaning category. Getting reviews is extremely simple. Thanks Szymon! Love hearing great feedback like that! I would recommend this service to all who are looking. The experience has been outstanding for me. Cons: Considering I don't have to continually send out email to clients for reviews and the fact that this software does all that I'm happy. If I have a problem I can get assistance from tech support who is always there is a plus. I have not experienced any cons from this software. Overall: The ease of completing a project and the software sending out the emails for reviews saves a lot of time and aggravation. This software is a huge benefit to running a business. We love hearing feedback like this Terrell! Thanks so much for taking the time to leave your review of NiceJob, we really appreciate it! Comments: I have been nothing but impressed with the quality of service and professionalism we have received from the Hatch team! They make difficult technical issues easy to understand and are very responsive to our needs. They have made a science of what they do. When we pose questions about why things are cared for in any particular manner, they almost always have an insightful answer. If, on a rare occasion, they don't have an answer, they humbly acknowledge it and work to identify the best solution. I don't think I have ever needed to ask the same question twice. They get it the first time! I wish all companies were as easy to work with as they are! Thanks Ivan, really appreciated! And we've got some upgrades coming this month that will make it even easier to build your companies reputation online, stay tuned! Pros: Easy to use once set up. It just runs on autopilot and if your team does a great job the reviews just pour in like never before. Cons: Just a little learning curb getting things going. Overall: Overall it's the best advertising decision I've made this year. Hi Mike! Thanks so much for taking the time to leave us that great review! We love hearing about results like yours, and behind the scenes were working every day to make NiceJob even better! Comments: I cannot say anything but good about my experience with Hatch! Their customer service is top notch, response to questions and requests is immediate, and their understanding of the online marketing world is unbeatable. I know little to nothing about online marketing, so I was a bit nervous about getting a website built. Thanks to Hatch, I didn't have to know anything. They take care of everything! If I want to make a change or adjustment in my site, all it takes is an email to customer support, and then it "magically" appears on my site. If I do want to do something myself, but don't understand how to, they walk me through it step by step. My site began paying for itself from day one, and it continues to generate TONS of business for me. Go with Hatch....You will not be disappointed!!! Very affordable. Great customer service and support! Overall great value! Pros: Review_feed widget that can be added to a website and presumably boost SEO (too soon to tell in my case since I just got NiceJob). Also, the automation that can be employed to increase the amount of reviews I get for my business. I do the best I can to incentivise my employees to ask for reviews, but this system ensures reviews get asked for after every single job we do. 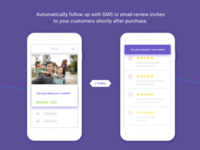 Pros: Increases reviews and customer conversions. Soo Glad, I could find a software that is budget friendly and works. Cons: I have not found anything that could possibly be a Con at this time. This software is great and the customer service is exceptional. It's been great working with you as well Robert! Really looking forward to helping you be the top rated professional in your area! Great review platform. I love that they send multiple requests for reviews via text and email. Pros: Nice Job integrates perfectly with my scheduling software so it makes receiving reviews very easy! Customer Service is top notch! Cons: Although Nice Job has several review sites for my clients to choose to leave a review with, there are some other sites I would like to see added such as Angie's List. Thanks for the great review Travis! Great value and ROI, would definitely recommend. Pros: Easy to use, wish I knew of this earlier. 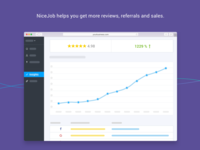 Nicejob makes it easy to stay on top of things to get reviews. Business is up and the increase in leads is more than expected. Overall: More business, more leads, more time to run the business. Thanks David, really appreciate the great review! Reach out anytime if theres anything at all we can help with! Comments: My SEO work paid off the moment I signed on with NiceJob. I had spent a good amount of time with both on site and external SEO. I had built my site using Wordpress. But I finally decided it was time to be more professional so I had NiceJob build a site for me. Within 1 week of taking the new site live I went from #9 ranking on Google to #2! On top of that they are easy to work with and the work continues to pour in with the ease of posting pictures and the resulting social media buzz generated by reviews. Good Stuff! Pros: I've tried other software for getting reviews. At first I wasn't happy with nice job ,but they've gotten much better since my first attempt . Cons: Can't yet detect whether some one has left a review already, but I'm not sure if this is still a problem. Comments: We are very happy with the quality of our website. We feel confident sending prospective clients to view it. The customer service and support is very personable and accommodating, answering all our questions. Thanks Brandi for the great review! Really look forward to keeping on working with you to grow your company! Best value out there! Top Notch customer service! Pros: Simple, easy to use and EFFECTIVE! I can't begin to talk enough about this product. Definitely made with the small businessman in mind. Overall: Automated follow up for asking for reviews. Our reviews have tripled in 3 months! Awesome results, great to hear! Pros: Great product to help grow your business. The customer service is unmatched. I really appreciate the automatic emails and simplicity. Cons: I cannot really report on any negatives thus far. Good customer service support from people. Pros: It puts reviews online which helps my company. The customer support people help a lot. If they did not help me in a timely fashion I would discontinue my business and hire another company. Cons: I upload my email list, and it sometimes doesn't load for me. Maybe it's an error on my end but still not as user friendly as I would like. Thanks Joe for, really appreciate the review! We take alot of pride in providing the best customer support possible. We'll reach out and see how we can help make the CSV upload smoother for you. Thanks again for working with us, have a great day! Thanks Sergio! Really appreciate the great review! Sorry about that exchange rate, it does hit Canadian companies, we'll make sure it's worth your while though! Comments: i am very impressed with the initial induction process that nice job had. We were very reluctant to go through the pain stakes process of a new website. Nice job did an "Excellent Job" the upload jobs, reviews and report all in one functionality is Excellent! Thank you to the team at Nice Job for your support! Thanks Terry! Really appreciate the review and feedback, looking forward to working with you to keep growing your company! Pros: The automated messages are preformatted, loaded and ready. The UI is simple too. Thanks for that. Cons: When I import multiple clients to send an invitation to, I have to click them all manually to start the invitation series. Overall: More and better reviews brings us more and better business, allows us to build trust with people we have not met, and sets us apart from the other competitors in town. Nice job is a clean and simple way , and user friendly way, for us to do that. Comments: I have had so many customers tell me they love our website. When I get an email and text message that we received a new lead I am able to respond very quickly. This has helped us convert prospects to customers quicker. Thanks for the great review Cameron! And please let us know if there's anything we can do to improve your experience with NiceJob, we're always here to help! Pros: NiceJob is easy to use out of the box. It's great for businesses that are starting out and getting their feet wet at collecting and managing reviews. Cons: NiceJob integrates with very few sites for leaving reviews. It does not integrate with sites for specialty businesses (e.g., legal, financial, real estate, etc.). Thus, it is limited for use by general, small businesses. Thanks for the review, we really appreciate feedback, and love hearing that you found it easy to use! We're integrating with several new specialty review channels in the medical and legal fields in the coming months, and just released an integration with Zillow! Please let us know if there are any specific sites that you'd love to see integrated and we'll do our best to have them added to our roadmap. NiceJob really does an AwesomeJob! Pros: Their code is very clean for their websites and they actually set up amazing tracking on Google Analytics for everything. I have never seen a developer that does such great work on the front end, back end, AND on Google Analytics. Usually I only see one of those 3 things. Thanks Zeke! Really appreciate the commendation. We're a bit obsessed about the details over here, it's the little things that make a truly great product! Comments: Hatch makes it easy for me to ask for reviews and for my customers to post reviews Reviews are like money in the bank. Definitely use these guys. Thanks Jim! And your rocking your company reviews, looks like your up 525% so far since joining NiceJob, great work! No brainer! THE very best company to manage and build your online reputation! Pros: It's extremely user friendly. They've thought of everything needed for reputation management. Great dashboard to help me keep an eye on reviews. Cons: There's really nothing I can think of that I don't like. Overall: The people at NiceJob have thought of everything. On top of the fact that they are passionate about helping small business owners to succeed, their system is super user friendly. They are not only accessible right there within the software, but also do a great job at following up and pursuing clients to make sure all their questions are answered. What a load off! Thanks Christianne! We're so exited to be working with you as well, you're reviews show what a great company you have built and we're going to do everything we can to make sure your reputation keeps growing and spreading!